You can’t swing a brick without hitting a good pie in Brooklyn. I’ve been working on my Kimchee Pizza recipe, I like a crust that bites back. I’ve played around with store bought crust, puff pastry and a few recipes, but this no-rise version works well. It’s very crisp and firm, not doughy at all. I added minced fermented radish kimchee (kkakdugi) and kimchee juice to the dough and it took a flying departure from the everyday slice. Here’s a preview of my dough recipe in progress. In large bowl, mix flour, yeast and salt with a whisk and refrigerate for an hour. Add water, kimchee juice, kkakdugi and oil and mix until the dough comes together. If it sticks to the bowl add 1 tbsp of olive oil and mix again. 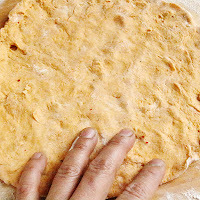 On a floured board knead dough five times. Form a ball cover with a moist dish towel and let it rest for ten minutes. Gently roll out five or six pieces. Lightly flour and place in a covered container. Brush (or spray) with a little olive oil and refrigerate over night. Before making pizza, let the dough rest at room temp for an hour. I used the usual pizza topping: sausage, onions, bell peppers, provolone cheese...etc. and of course Napa cabbage kimchee. I also added some Korean chili paste (gochuchang) to the sauce to make this kimchee pizza tangy and spicy. I even made a vegetarin version with tofu. It was a vast improvement to those sloppy bell pepper and onion pizzas. Preheat oven to 550°F. A baking stone helps distribute the heat evenly. By happy accident, I found that placing a baking sheet at the bottom of the oven has a similar effect. I forgot to remove it from the oven. On a lightly floured board gently press dough into rounds by hand making lots of dents with your fingers. The dents give the crust more crunch. Brush with olive oil and lightly sauce the dough. Use your favorite toppings and provolone cheese, then add more sauce. Transfer pizza to an ungreased baking sheet and bake for 20 to 25 minutes (middle rack) or until the cheese melts evenly without browning. Slice into even pieces and serve hot! These bad boys are ready for the oven. Are you ready for the crunch of a spicy, tangy kimchee pizza?